Your FTP or Functional Threshold Power is an important number to know if you want to improve your cycling fitness, this simple cycling threshold test will help you determine your FTP. There are whole books written about FTP (Training and Racing with a Power Meter ). Put simply it is an important threshold for endurance sports, above that threshold you produce too many waste products (lactate) for your muscles to work effectively. Knowledge is Power. When you know your FTP value, for example 150 beats per minute for heart rate, you can monitor your pace during longer rides and sportives to keep your effort level below your lactate threshold. When you put in big efforts, for example when climbing, you will probably go above your lactate threshold. For longer 20km+ climbs that you encounter in the Alps knowing your lactate threshold can help you to set a sustainable pace that means you’ll finish the last climb of the day strongly rather than looking over your shoulder for the broom wagon. Again put simply by riding below your cycling threshold level you will be able to ride for longer. The second reason FTP is importnat is that you can improve your FTP. Your lactate threshold is one of the most “trainable” aspects of your fitness that you can have control over. Specific interval training work that should be part of any sportive training plan can help your body process the waste products associated with exercise better. That means that for a given heart rate your body will be working more efficiently, allowing you to generate more power before you hit your lactate threshold. How do I do a Cycling Threshold Test? Until now performing a cycling threshold test has been the reserve of hit and miss field tests or expensive lab tests. Now thanks to our Partners at The Sufferfest and Dig Deep Coaching you can perform a cycling threshold test at home! 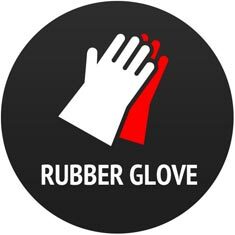 Rubber Glove is a specific FTP test video developed to allow you to train smarter by determining your FTP at regular intervals over your training year. You need to do this test indoors on a turbo trainer and as a minimum you need a heart rate monitor. When you hit the 20 minute test section of Rubber Glove, press lap on your bike computer and press lap again at the end of the 20 minutes. If you use TrainingPeaks you can then view your average heart rate for the 20 minute test lap. That value will be your FTP and you’ll be able to use it to set accurate heart rate training zones to match your cycling training plan. Designed by the expert coaches at Dig Deep Coaching, this one hour workout is specifically designed to get you ready for, and then do, a 20 minute cycling FTP test. Having said that, it’s also a great training session in its own right if you’re looking for something with a gradual build, some speed work and then a long, high-intensity interval. The structure is based on the work of Dr. Andrew Coggan and the 20 minute test has become one of the defacto standards for determining FTP. You’ll be able to do this workout every 10-12 weeks to gauge improvement in your FTP (as long as you do it exactly the same way every time). Now you know what FTP is and why it is important there is only one thing left to do – your cycling threshold test! Credits: Image, video and workout all courtesy of our Partners The Sufferfest and DigDeep Coaching. Knowing this information can be super valuable! I started training and racing with a power meter this season (highly recommend that book too) and I have seen some serious gains. They are the secret weapon to perfect pacing on long climbs. When I did the 20km Col de la Croix with Tom I was able to target my threshold watts and simply ride the rivet the whole way up, knowing I could keep that pace and didn’t have to worry about exploding with 2km left to go. Science!